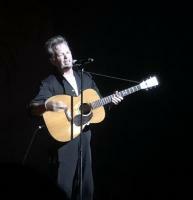 THE VOICE JUDGE " JOHN MELLENCAMP"
John Mellencamp Community > MELLENCAMP.COM ANNOUNCEMENTS > Ask Mellencamp.com > THE VOICE JUDGE " JOHN MELLENCAMP"
I truly believe that John needs to be a Voice Judge. He needs to take Jennifers seat. I know the ratings would sky rocket with him on a chair. He would be so perfect for this. Hes been around longer than most and his talent is WAY better than MOST. Hopefully maybe he will get my letter and so will THE VOICE and my dream to see him turn a chair will come true. Love you Mr JOHN!! Your fan, Kandie Carmean Trotwood, OHIO! Re: THE VOICE JUDGE " JOHN MELLENCAMP"
The last thing John needs is to be associated with ''The Voice'' in any way, shape, or form. A guest judge, like Keith Urban perhaps... but listen to John's thoughts on the processes of the newer artists and then you may have a great insight to whether he'd do this or not.